216 pages | 21 B/W Illus. "Learning from the process that engaged so many stakeholders at national and international level is important for future multilateral negotiations. This contribution from three actors intimately involved in the process offers rare insights into a long, challenging and ultimately fruitful process. I hope many readers will enjoy the insights presented in this book and be inspired to realise that the impossible is possible through compromise, partnership and leadership." "This is an important book that charts the journey we went on and the challenges faced in agreeing the 2030 Agenda for Sustainable Development. I hope it will help people understand what was achieved and help those now, and in the future, engaged in the implementation of this agenda." "Having participated in various negotiations on sustainable development since 1992, this overview of the process leading to the ambitious and important Sustainable Development Goals allows us to see the big picture and helps make the journey ahead possible." "As the most prolific writer on issues of sustainable development and the multilateral system, Felix Dodds has done it again; on this occasion, working with Ambassador David Donoghue and Jimena Lieva Roesch. These three authors have brought their individual and collective knowledge and expertise to review the 2030 development agenda, consolidated in a recently articulated set of Sustainable Development Goals (SDGs). Offered by people who were immersed in the process, theirs is a necessary and timely analysis of how the multilateral system works, the consultations and negotiations out of which the SDGs evolved and their intended objectives. Given their backgrounds and proximity to what took place, the authors have brought to their subject the quality of information and analysis likely to be useful to those who will be engaged in fulfilling this agenda within the multilateral system and its myriad stakeholders. When compared with the MDGs, the very large number of sustainable development goals and targets suggest very high ambition and an enormous undertaking at both the national and international levels. For students of development and international relations this will be an essential book. It will become a useful tool for peer review of the attainment of the SDGs. Coming so soon after consensus on the SDGs and the new development agenda were reached, the authors engage in an important discussion on which future books on this area will draw and be assessed. All three authors are to be congratulated for this important piece of work." "Experienced journalists covering UN negotiating meetings on sustainable development issues tend to make a bee-line for Felix Dodds to discover what is going on. 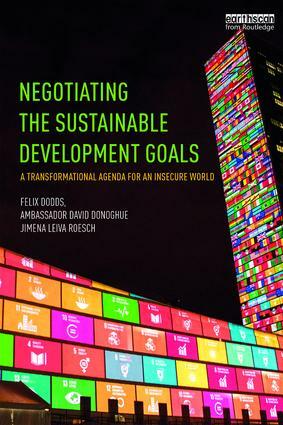 Now he, and his equally well-informed co-authors – Ambassador David Donoghue and Jimena Leiva Roesch – are doing everyone a service by extending the privilege through this book, which traces the often tortuous process that led to the agreement last September of the Sustainable Development Goals. Though AS OF YET little-known outside the international environment and development community, the Goals are – as the authors write – ‘a blueprint for the development of humanity and the planet in the 21st century’. Their adoption marks the moment when a decades-old argument was finally won. This book charts how that happened and suggests how the victory should be followed up with action. " "Negotiating the Sustainable Development Goals is an important and timely contribution to global development policymaking that will further our understanding of how the SDGs became the new overarching framework for a comprehensive development agenda – and help inspire and guide their implementation." Informal alliances – why are they important and how did they shape the process? Climate Change and the 2030 Agenda: competing or complimentary agendas? Is the UN fit to implement the 2030 Agenda? Felix Dodds is a Senior Fellow at the Global Research Institute and a Senior Affiliate at the Water Institute at the University of North Carolina, USA, and also an Associate Fellow at the Tellus Institute, Boston, USA. Felix has edited or written fourteen books on sustainable development and UN-related issues and was Chair of the 2011 UN DPI NGO Conference 'Sustainable Societies Responsive Citizens'. From 1992 to 2012 he was Executive Director of the Stakeholder Forum for a Sustainable Future. Ambassador David Donoghue is Ireland's Permanent Representative to the United Nations in New York, USA. He co-facilitated, with the Permanent Representative of Kenya, the negotiations at the UN which produced the 2030 Agenda for Sustainable Development. He also co-facilitated, with the Permanent Representative of Jordan, the negotiations which agreed the outcome of the High Level Meeting on large movements of refugees and migrants held at the UN on 19 September 2016. Jimena Leiva-Roesch is a Senior Policy Analyst at the International Peace Institute. Previously she was a diplomat for the Permanent Mission of Guatemala to the United Nations in New York, USA. She was a lead negotiator for the 2030 Agenda for Sustainable Development and for climate change. She offers hands-on training on multilateral negotiations to diplomats and students worldwide. Jimena was an active member of the Security Council team when Guatemala was an elected member in 2012–2013.